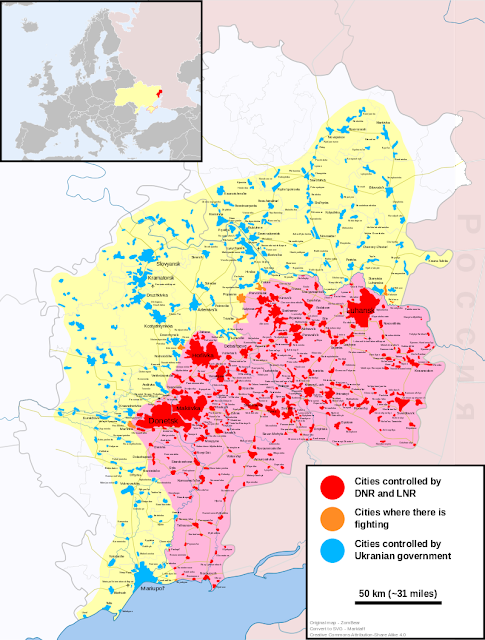 With ongoing wars in the Middle East, it's easy to forget the Ukraine conflict. If you're outside of Ukraine, that is. Russian-backed separatists violate the Minsk II protocols almost daily, usually through quick attacks that kill civilians or idle Ukrainian soldiers. Sometimes there are dozens of violations in a single day. Over the weekend, separatists shelled the outskirts of Mariupol, killing a few people and wounding perhaps ten, using Russian-provided artillery. The pickup in activity around Mariupol comes alongside the massing of about 50,000 Russian troops on the Ukrainian border. It's not particularly surprising: Mariupol is about 45% ethnically Russian and was a site of a number of pro-Russian protests, as well as fighting during the Donbass war. 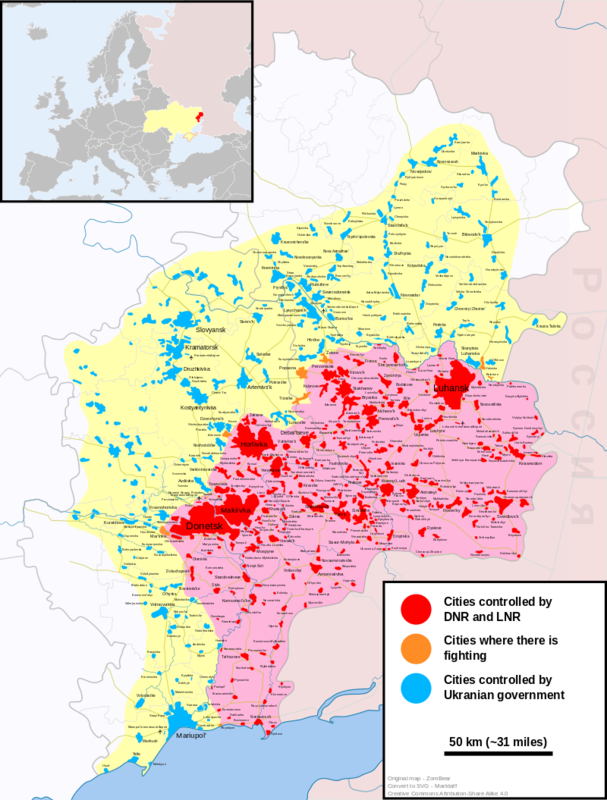 We've been predicting that it was next on the hit list since Minsk II was signed, largely because it would provide a major port city to a pro-Russian separatist state (resembling something like Abkhazia. It's not yet clear how hot the fighting will get, and when. Russia is heavily dependent on propaganda to keep fervor whipped up among its citizens and foreign supporters. These shellings may be a probe (where plausible deniability is higher than a full attack) or an attempt to cause Ukraine to react heavily enough to "justify" another Russian incursion--a tactic that was used to great effect in the South Ossetia war. Shelling had picked up a few months ago before quieting down, and Ukraine may be simply gritting its teeth and trying to wait it out, rather than allowing itself to be goaded into giving Russia an excuse to return to Ukraine in force. Houthi victory in Yemen looked almost certain for months. Through the spring, the Houthis had pushed government troops into Aden and had almost taken the city. Had Aden fallen, government troops would have likely been unable to recover, their main forces having been destroyed. Through late spring and summer, the Saudis have been arming government troops and bombing Houthi positions. For some time, the situation seemed to be delaying the inevitable. 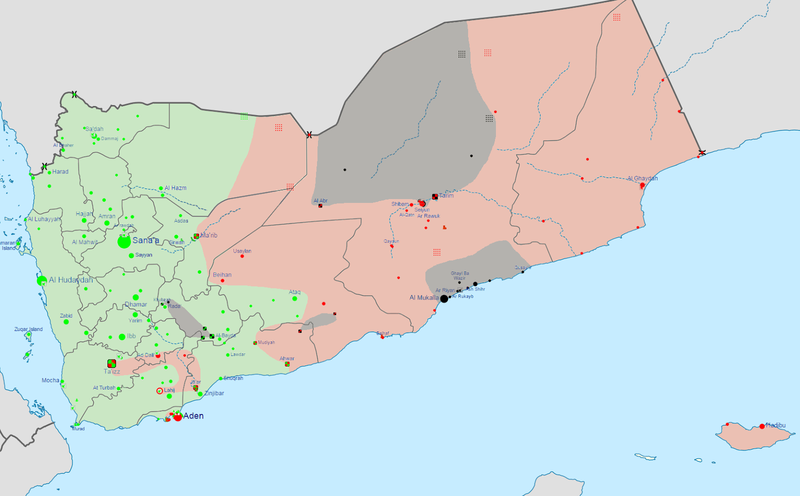 But, almost-miraculously, government troops in Aden held on and then launched a counter-attack that drove the Houthis out of Aden and secured the port city in late July. The Houthis attempted a counter-attack, but were repelled. 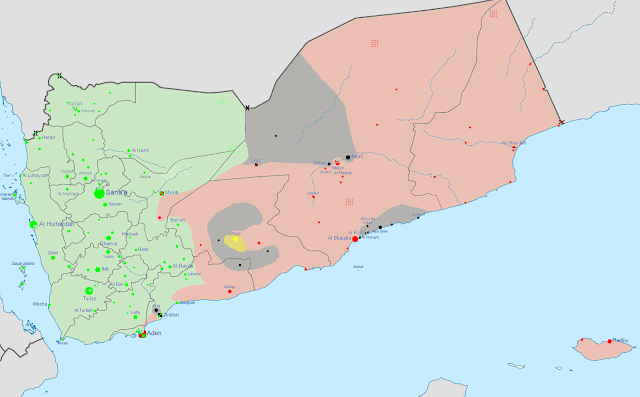 In the two weeks since, government troops broke out of Aden to take the surrounding environs. And in the previous three days, the government army accelerated its advance, linking up its split eastern and western forces, and also advancing towards the north of Sana'a. It's a fairly incredible turnaround. The majority of Houthi forces are likely being pressed in the south, which means the threat to Sana'a in the north may be quite realistic--particularly with Saudi air support. We'll keep an eye on it.